Nezo operates worldwide global supplying high quality consumable goods and services including hydraulic/mechanical tools, plant consumables & spares, general safety items, safety boots and environmental clean-up & maintenance items, It also offers transport solutions, including car rentals in Ghana and Sierra Leone. Nezo Oilfield Supplies Ltd has chosen WAMPEX 2018 because it offers ” a platform worth taking advantage of to increase its reach in the oil & gas, and mining industries”. Additionally, the company says it also wants to use WAMPEX as an opportunity to introduce its latest range of products and services to both existing and new clients. Incorporated in 2010 and located in Tarkwa with a branch in Takoradi, both in Western Region-Ghana and a Branch in Freetown, Sierra Leone, Nezo operates worldwide global supplying high quality consumable goods and services including hydraulic/mechanical tools, plant consumables & spares, general safety items, safety boots and environmental clean-up & maintenance items, It also offers transport solutions, including car rentals in Ghana and Sierra Leone. During this year’s exhibition, Nezo will be exhibiting Hi-Force Hydraulic and Mechanical Tools-UK, Complete Environmental Products-USA, Drager Safety Equipments – Germany, Panther Oil & Gas Safety Boots – Italy, Dy-Mark PTY Limited – Australia, Master Lock – Lockout Tagout-France/USA, Viking Life Saving Equipment-Netherland, ATG Safety Glove solutions-Sri-Lanka / SA with their main focus of drawing more attention to the range of top notch products and services rendering in Ghana and across the West African sub-Region respectively. 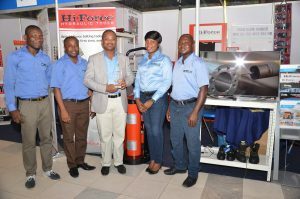 « EXHIBITOR NEWS: Ghanaian pump and valve expertise showcased by Sunbabsco at WAMPEX 2018 » EXHIBITOR NEWS: Here’s why Dunlop conveyor belts are a great choice.